It feels so good to finally back after the long Digital Fashion Week trip (will talk more about that in the upcoming posts). I feel so sad to leave my #DFWinsider friends and flew to our own respective countries. It was an amazing 2 weeks experience with my fellow influencers! On the other hand, sleeping in my own room and bed never feel this special to me. Spent a lot of cuddling moment with my baby Chanel since last night up ’til now while I’m typing in front of my laptop. I was super tired yesterday and this luggage incident happened to me. I flew from Bangkok and transit to Singapore for just about 15 mins so they left mine in Singapore as they didn’t have enough time to transferred it. Thank God I used Singapore Airlines, which I can put my trust on without worrying about my precious stuffs. I believe you are familiar with the watch that I’m wearing in this look as I’ve been posting my Lamer x Olivialazuardy watch a lot on my Instagram. I designed this watch to be wearable for every occasion from formal to casual. 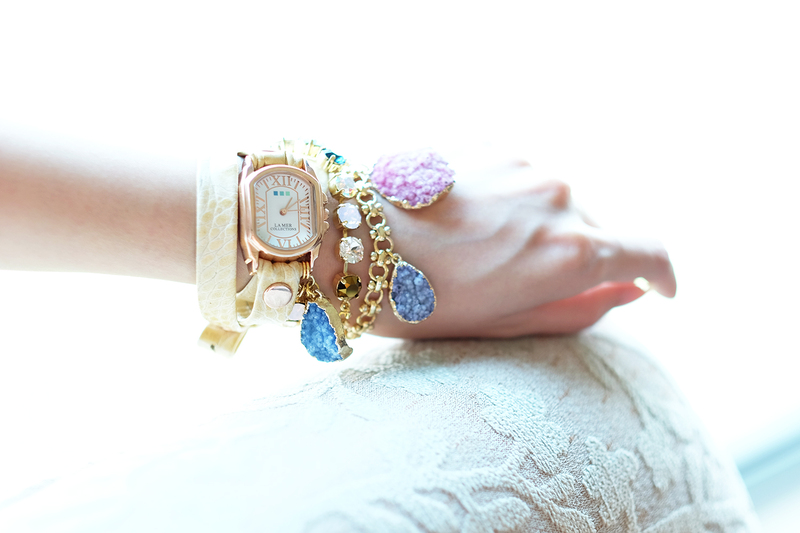 I used Croco print leather, Rosegold watch case, One strand of Sunset Swarvoski Crystal bracelet and gorgeous multi color Druzy Stones – Gold bezeled Pink Druzy, Gold Bezeled Blue Druzy, Gold Bezeled Teal Druzy attached directly to the watch’s 14k Gold Plated case and strap. If you are looking for an elegant watch, this one is for you. This is my first casual look that I post on the blog for your perusal. I am wearing Cloth Inc Latest collection peplum top and skort. So happy to find out that they launched a new website made by 82cart! Their peplum top and skirt turned out to be a good combination as their peplums can stack on top of each other without looking too much. This watch can be worn to a more formal – semi formal outfit too, I’ve worn this many times with my structured dresses to attend fancy dinner. They are now available online, if you are thinking of buying it as a gift, you can choose the gift box on the website before you add them to the cart. How convenient is that? Here I provide you the direct link below for your easements!